Do you love a good mystery? Join the library's newest Book Club, "The Armchair Detectives!" The group will be discussing Still Life by Louise Penny. 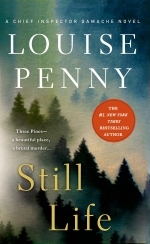 Still Life introduces not only an engaging series hero in Inspector Gamache, who commands his forces---and this series---with integrity and quiet courage, but also a winning and talented writer of traditional mysteries in the person of Louise Penny. Copies of the book are available at the Front Desk.